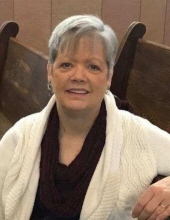 Barbara Nadine Ott, 65 of rural Greenfield passed away on Wednesday, February 6, 2019 surrounded by family at her home. Funeral service will be at 11:30 A.M. on Tuesday, February 12th at the Johnson Family Funeral Home in Stuart. Visitation will be one hour prior to the service at the funeral home. Committal service will be held at 1 P.M. on Wednesday, February 13th at the Aurora Cemetery in Aurora, Nebraska. Memorial contributions may be directed to the Bethel Baptist Church. Online condolences may be left at www.johnsonfamilyfuneralhome.com. Barb was born on October 11, 1953 to Hubert B (Bill) and Wilma Jean (Martin) Travis in Corpus Christi, Texas. As a young girl the family moved to Ripon, California. She attended school in Ripon and graduated from Ripon High School with the class of 1972. She later moved to Kemmerer, Wyoming where she met a young minster named Lonnie Ott in 1982. The couple was married on August 13, 1983. To this union one son, Tim was born. Barb continued to follow Lonnie’s ministries to Louviers, Colorado, Thornton, Colorado, Columbus, Nebraska, Okeene, Oklahoma and lastly Bethel Baptist Church in Stanzel. Barb worked as an in-home child care provider and also worked as an in-home elderly care provider. Barb and Lonnie owned and operated a Christian Book Store in Columbus, NE where she became fond of collecting Precious Moment statues. She loved tending to her flower garden, riding horses, reading and singing. She especially enjoyed worshiping at church with her church family, and teaching the children and youth in Sunday School and Youth Club. Barb was preceded in death by her father, Hubert (Bill) Travis; sister, Sherri Hall; and sister-in-law, Marva Lee Reimers. She leaves behind her loving husband of 35 years, Lonnie of Greenfield; son, Tim Ott of Yukon, OK; mother, Wilma Jean Travis of Ripon, CA; brother, Terry (Brenda) Travis of Twain Harte, CA; sister, Chris (Mike) Johnson of Ripon, CA; brother-in-law, Terry (Linda) Ott of Aurora, NE; her loving church family; a host of nieces, nephews, extended family and friends that will miss her dearly. To send flowers or a remembrance gift to the family of Barbara Nadine Ott, please visit our Tribute Store. "Email Address" would like to share the life celebration of Barbara Nadine Ott. Click on the "link" to go to share a favorite memory or leave a condolence message for the family.